On April 8, 2014 Microsoft ended support for Windows XP, one of the most popular operating systems ever. Industry experts estimate that Windows XP is still being used on nearly 30% of PCs. An estimated 500 million computers, kiosks, ATMs and other systems are still running XP. A massive shift forward to newer versions of Windows is expected this year with the end of support. By popular demand, the XE6 upgrade pricing to XE developers is being extended for a limited time (previously only available to registered users of XE2 or later). From now until 30 June 2014, XE developers can purchase the XE6 "upgrade from XE2 or later" products. This offer does not apply to any other earlier version developers. Take your applications to new heights by integrating with leading Back-end as a Service (BaaS) providers to add functionality and platform services to your mobile and desktop applications. Whether you have an immediate need or just want to learn more about the potential, David I will show you how to gain easy access to common services in the cloud without having to build or maintain the back-end services yourself. See what’s new with FastReport and FastCube VCL and FMX. You’re invited to join Embarcadero with Fast Reports’ Michael Philippenko and Den Zubov for two new webinars on reporting for RAD Studio, Delphi and C++Builder developers. FastCube VCL 2 and New FastCube FMX - OLAP Components for your Software! Data security is a hot topic right now. When it comes to securing your data and applications, small changes can make a massive difference. If you want to learn how to help reduce the risk of being hit by the next Heartbleed and how to reduce the time and effort to managing security, then this webinar is for you. Don't miss C++ Mobile Day! Join Embarcadero team members, top industry speakers, technologists and practitioners for a day of informative technical sessions focused on mobile development with C++! C++ Mobile Day will show you how to visually create Android and iOS apps coded in C++. You will learn how to build apps that can run on tablets, smartphones and wearables with access to platform APIs, sensors and services. This 42-page technical white paper covers a typical scenario in the IT world including architecture and techniques for connecting with a database server and providing data to different front-ends using different technologies. Learn from the guys that know, don't re-invent the wheel, avoid the traps that others have fallen into! 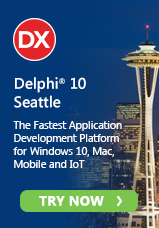 Watch Marco Cantù in the popular RAD in Action webinar series that covers what's new in RAD Studio, Delphi and C++Builder XE6 for Windows developers including new VCL styles, components and how you can transform the potential of your existing Windows applications with app tethering! The RAD Studio XE6 First Look webinar is now available on demand. Watch John "JT" Thomas and Marco Cantù as they give an overview of what's new in XE6. Thousands attended live and now it's available on-demand. Copyright © 2014 Embarcadero Technologies, Inc. 100 California Street, 12th Floor San Francisco, CA 94111 U.S.A.